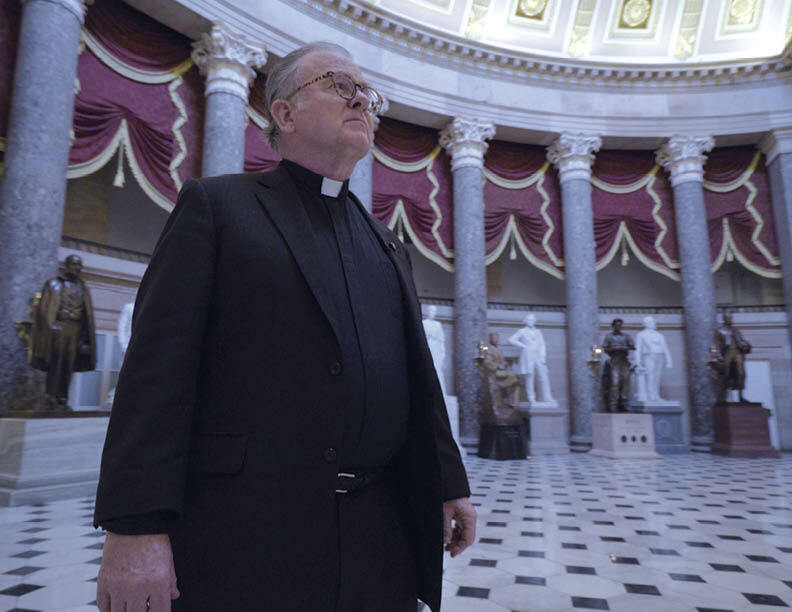 Patrick Conroy, S.J., became the 60th chaplain of the U.S. House of Representatives in 2011. He recently sat down with Jeremy Zipple, S.J., to talk about the place of faith in Congress. I imagine a lot of people are surprised to find out that Congress has a chaplain. Separation of church and state. That sort of thing. Establishing a chaplain was one of the very first acts of Congress, so a constitutional challenge to a chaplain would have to go back to the intent of the founders. When you talk about constitutional separation of church and state, well, the same people that wrote that were praying and hiring a chaplain to pray. That said, I am the second Catholic chaplain ever, but I am not the Catholic chaplain of the House. I am the chaplain of the House. My congregation, if you will, is not a Catholic congregation nor is it my intention that it be so. That’s precisely what our Constitution stands for. If somebody were applying for this position and came in and said, “Well, my conscience and my ministry is about converting people to...”—they are not going to get this job. What is the day-to-day like? Every day, the House opens liturgically. The House comes to order, and it is a liturgy. I give the opening prayer. You can check it out on CSPAN. I am available, and I try to go where members are gathered so that I can see them and they can see me. Back when I was a college chaplain, I used to eat in the student dining hall because that is where that would happen. Here it’s being on the floor during votes. Where a lot of prayer is needed. Yup. A lot of prayer is needed. I heard that Pope Francis asked you for a prayer before his address to Congress. I knew I had all of about 20 seconds with him. I can speak a little Spanish, but I figured I would be starstruck, and what kind of a conversation can you have? In Spanish, I welcomed him to the Capitol—one Jesuit to another. He acknowledged that. Then I asked him if I could give him a blessing. That’s how that happened. He is always asking people to pray for him, so I figured that was a pretty safe way to go. I imagine Pope Francis’ visit was a highlight of this job. Any other moments of grace? Moments of grace would certainly include Pope Francis’ visit. Everybody around the building that day was really in a pretty good mood. People wanted to put down the normal contentious stuff and share the experience of having a very popular and authentically religious person here. The guy has got it going. There is authenticity there that is so rare that when it arrives people respond to it. You are chaplain to people on both sides of the aisle in a rather contentious period of the history of this body. Do you see, in your position, any signs of hope for cooperation? When I first arrived in 2011, people from the Democratic side never crossed over on the floor to speak with somebody on the Republican side, and I never saw anybody from the Republican side cross over and speak to someone on the Democratic side. Speak about anything. Anything. It was noticeable. Now that was in the wake of the Tea Party wave. Since then, that has really broken down. You find people that are actually talking to one another and some of them are not your usual suspects. Congress has a majority leader and a minority leader who are both Catholic. Is their faith something that is important to them? Are they authentically Catholic so far as you know them? I would say that Paul Ryan and Nancy Pelosi are very serious about being Catholic and being the best Catholics they can be. I would say that's true of most members of Congress in terms of their religious and political positions. So avoid calling someone a “bad Catholic.” Have a bit of respect that these people aren't just frivolous about their positions. They really, really do struggle with these things. Any behind-the-scenes insights into the lives of your “congregants” you could share? What I always try to do is describe what a Congress person's life is like. They come to Washington and for four days at a time are engaged in the contentious debate. Ten-hour days, 12-hour days. They work in a very toxic environment. When I say that, I am not saying politically toxic. I am saying humanly toxic. It is a toxic way to live. They go home to their office. Basically, these people are doing a highly tense and anxiety-producing daily chore without the comfort of family. There is plenty of uncertainty around the new presidential administration. Any prognostications on how a Donald Trump presidency affects Congress? One hopes that both parties will be struggling to find out how they can work with Donald Trump. One hopes they will do that admirably and nobly and that the president-elect himself, having been called to a new office, will respond with the same hope and goodwill. My ministry does not change. I joke that I still pray for miracles every day. There are political observers out there who would say, “Well, we need it now more than ever.” But no, we have always needed it. I have great faith in the United States of America, in our way of proceeding. As awful as things might look to many, and some are justified, I have hope that God is with us. This article also appeared in print, under the headline "Man of the House," in the January 23, 2017 issue. Jeremy Zipple, S.J., is the executive editor of America Films.